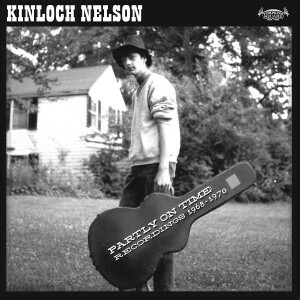 Kinloch (sounds like “kin-law”) Nelson (b. 1950) studied classical guitar privately with Stanley Watson, jazz guitar with Gene Bertoncini at Eastman School of Music, and music theory at the University of Rochester. In 1973, he began teaching both privately and at The Hochstein Music School where he was on the faculty for twenty-five years. In 1985, Nelson co-founded the Guitar Society of Rochester, which during its ten-year run presented many of the world’s greatest guitarists. Nelson is the author of a book, Alternate Guitar Tunings. He currently teaches privately, conducts guitar workshops and maintains a performance schedule. Nelson came to the attention of Tompkins Square via Duck Baker, who visited Rochester in 2018 supporting his own Tompkins Square archival release, Les Blues Du Richmond : Demos & Outtakes, 1973-1979. Since late 1967 Carter and I had been playing guitars together, working on songs of the day: Simon & Garfunkel, Bob Dylan, Donovan. Before long we were writing songs and instrumental guitar tunes. We borrowed someone’s Sony reel-to-reel tape recorder and started making recordings. But, WDCR raised the bar. Somehow we persuaded Dave Graves to record us, and that’s how these recordings came about. Recorded at various times in the summers of ’68, ’69, and ’70, and in the winter break of ’69-’70, three of the songs in this collection are ones we did together, the rest are solo tunes of mine. In the summer of 1969 I went back and recorded some more, this time alone, and was there when Apollo 11 landed on the moon. The first rumors of the coming Woodstock Music And Art Fair were circulating. FM underground radio was emerging. Music genres were cross pollinating. It was an exciting time to be writing music. Carter and I went back to WDCR to record again that winter, and I went again by myself in the summer of 1970 to work at the station and record some more. But after those days, we pretty much went our separate ways. Sadly, somehow during all this the master tapes got lost or erased. The tapes that survived are copies. So, one night in the summer of 1970, after I recorded “Kittens,” Tom Siebert’s Boat,” and “Winnipesaukee Night,” a friend of mine and I were listening to the tapes on my crummy little stereo and decided to take them over to his house to play them on his dad’s amazing hi-fi set. Off we drove with the tapes, my new tape recorder and my guitar in our family car. There’s an intersection in my hometown where a town road crosses a highway. That night as we were crossing the highway, a drunk driver, running from an accident he had caused at the previous light, ran the red light and hit us broadside. Wham! The car folded in half, the windows shattered, our car spun around 180 degrees and the tape recorder and all my tapes flew out the window and landed all over the highway. I should have been killed, but fortunately the driver hit the brakes and crashed into the passenger door just behind me. Amazingly we survived with only whiplash! My guitar, a 1960s era Gibson J-50, was in the back seat and didn’t fare as well, taking the full brunt of the crash. But the tapes and the recorder survived, and no one ran over them. I never met the driver. He was immediately taken to the hospital. He never showed up in court. They jailed him. The insurance company replaced our car, gave us some cash and I bought a brand new Martin D-18. And, they let me keep the J-50, which I later fixed. That tape recorder has long since failed, but the tapes held up. I never thought they could be released commercially because, being copies, the quality wasn’t that good. Over the years I figured I would re-record the songs. But ultimately I never did, because how can one recapture the original mindset, feeling, vibe of the times and in particular the sound of that now-replaced studio? But thanks to the digital era the tapes have cleaned up reasonably well and the songs have come to life.